Spaghetti Ice Cream Maker | OhGizmo! We all know kids can be fussy during dinner and at times it can be nearly impossible to get them to eat their ice-cream but parents everywhere can now breathe a sigh of relief as the Spaghetti Ice Cream Maker promises to make meal time something to look forward to. Instead of giving your kids an unappealing bowl of ice-cream with chocolate sauce which they’ll no doubt refuse to touch why not turn it into something more appealing and kid-friendly like a plate of spaghetti, lasagna or even asparagus? (Not pictured.) With strawberry sauce as the perfect look-a-like for tomato sauce and grated white chocolate as a convincing substitute for parmesan cheese your kids will be too busy chowing down to realise it’s not good for them! 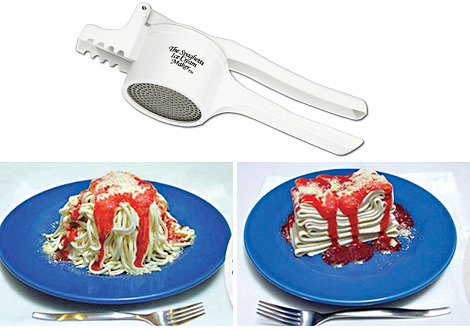 The Spaghetti Ice Cream Maker is available from The Lighter Side for $14.98. This is so cool! I used to get spagetti ice cream in Germany back in the 80s and I never thought I’d see it again. Thanks. This item looks suspiciously like a normal sp?tzle maker or a potato ricer with some additional writing on the side! Shhhhh! Pay no attention to the man behind the curtain! This actually does look pretty cool. I like trompe l’oeil foods, and I LOVE ice cream. I’m not too sure whether I like the idea of the Spaghetti Ice Cream Maker or not. I mean, I adore ice cream, and yes, I love my spaghetti, too, but do I really want to eat ice cream that looks like spaghetti?